Utah Gov. Gary Herbert has signed a law authorizing the use of firing squads to carry out death penalty sentences if officials cannot acquire lethal injection drugs, making the state the only one in America to approve of the method. “Those who voiced opposition to this bill are primarily arguing against capital punishment in general and that decision has already been made in our state,” said Marty Carpenter, spokesman for Herbert, as quoted by the Guardian. Although Utah is not expected to execute another inmate for years, capital punishment opponents have railed against the measure. "It's an embarrassment to Utah,"Ralph Dellapiana of the group Utahns for Alternatives to the Death Penaltysaid to the Associated Press. "We should be taking the moral lead on this. You can' be bothpro-lifeand pro-death." Last week, Herbert said he was "leaning toward" signing the bill so that the state could have a viable alternative to lethal injection when the appropriate drugs are not available. He has also called the use of a firing squad "a little bit gruesome,"though that did not keep him from signing the bill. "The debate is really more than just the firing squad. It's should we have capital punishment or not?" he said at the time, according to NBC News. "It's not our preference, but we need to have a fallback." The move comes as multiple states seek alternative methods for carrying out death penalty sentences, as many companies refuse to sell various drugs used in lethal injection combinations to state correctional departments. Currently, death row inmates in Utah can be executed by way of a firing squad, but they must choose the option themselves. 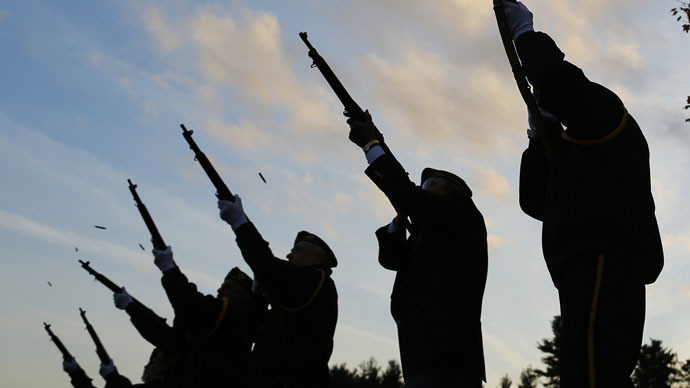 Now, the state will be able to employ a firing squad regardless of the prisoner's choice. The last prisoner to be executed by firing squad in the state was Ronnie Lee Gardner in 2010. While Utah may be the only state condoning the use of this method, other states are also looking into different means of execution. Last year, Tennessee became the first state in the US to authorize death via electric chair in the absence of lethal injection drugs, though the law faces a legal challenge from inmates who argue the method is unconstitutional. Meanwhile, lawmakers in Oklahoma are considering a bill that would allow gas chambers to be used in executions.The Supreme Court is currently reviewing the state's lethal injection formula to determine whether it violates the Eighth Amendment’s protection against cruel and unusual punishment, since the state had a number of botched executions.